buy that is related to farming or logging with horses, mules, donkeys, or oxen. If you are seeking a draft animal or team, you may post your message here. The listing information has been supplied by the seller. 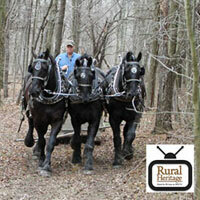 Rural Heritage assumes no liability relative to the content or use of this service. Jay Hawk Stacker/Van Brunt Drill/ Rolling Mill /Home built wagon/ ETC. This file last modified: Aug 28, 2017.